The usual books stacked next to my comfortable wingback chair in the oak-panelled library for review lean towards accounts of great races, great (and sometimes not-great-at-all) athletes, startling training methods, startling diets, irresistible tourism ideas and lots of road-going technology, both old and new. But occasionally a book comes to us that does not fit into any of these categories and not only informs us of previously-unknown facts but might have an importance extending beyond cycling enthusiasts. One of these books has to be “Roads Were Not Built for Cars” by Carlton Reid, an exceptionally well-researched book whose very title is fightin' words. This might be ammunition against those motorists (we have all experienced them) who loudly proclaim that cyclists have no right to use public roads but the author unrolls a fascinating story whose details occasionally surface but the greater history has certainly been lost, or buried. In 2013 Mr. Reid put out an appeal on a crowdfunding site and obtained pledges from 648 people, enough to conclude his massive four year research effort with a book that totals 170,000 words and in electronic format includes 580 illustrations and more than 10 videos. Yes, an electronic version: the book was conceived for iPad iBooks and is available in that way as well as via Kindle and an ePub version. A softback version was sent to subscribers and a hardback edition sold out in six hours. A revised edition will be published in 2015. 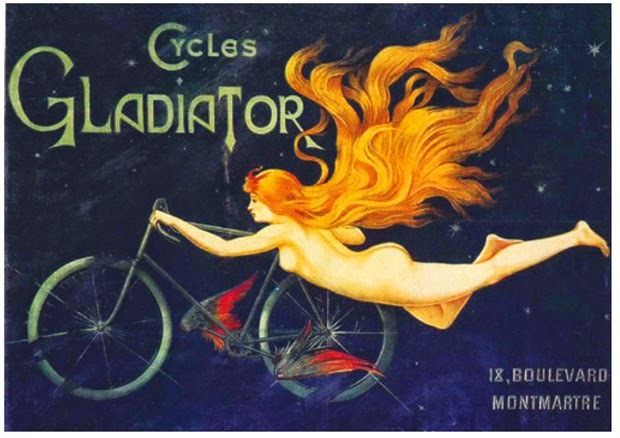 So the most modern technology (crowdfunding, e-publishing) has been used to present a story that covers the period from the high-wheeler era and the start of the safety bicycle to the fading of the two wheeler from the consciousness of the motorcar-obsessed world. 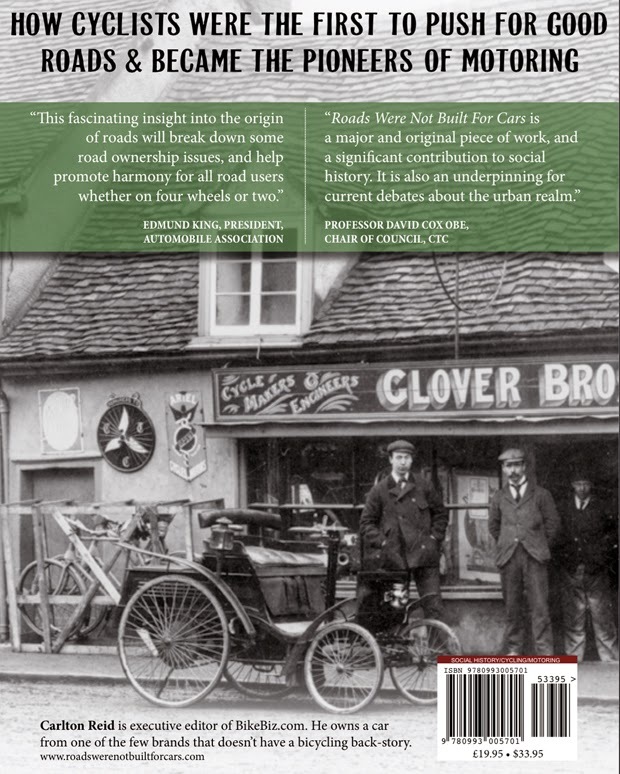 We find ourselves perhaps on the leading edge of a great new bicycle revival but Mr. Reid's book informs us of an unknown world that existed only less than 150 years ago and shows how our current world could have been much different. 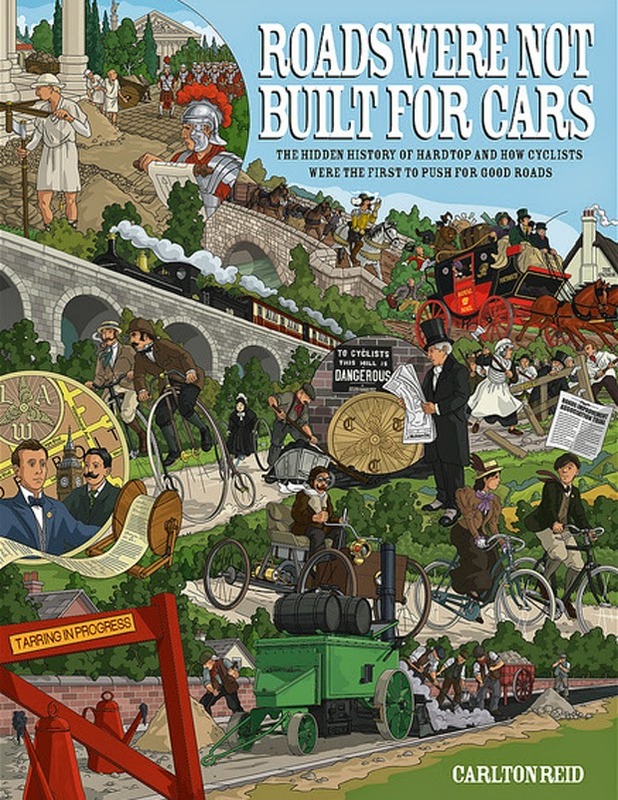 The theme of this important book is the history of roads and in particular the importance of cyclists in developing the excellent roads we take for granted today. The author, who is British, focuses primarily on the UK and US experiences centred on the 1880-1900 period but also provides a good account of the history of roads before then, from the construction of the straight Roman streets to the turnpikes of the 18th Century. 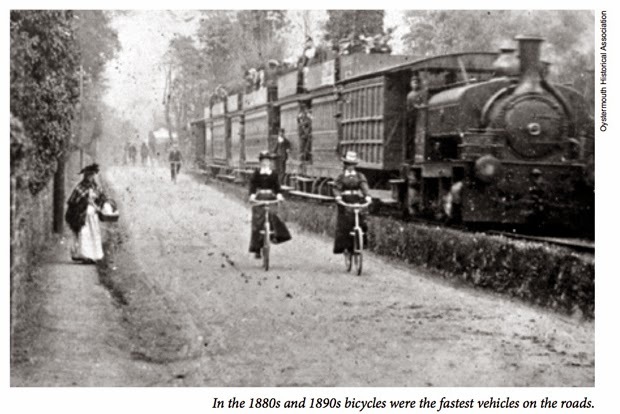 But the first surprise he reveals is that by the time bicycles had appeared on the scene in a significant way roads, once used by horse-drawn stagecoaches and mail express wagons, had been rendered obsolete by the railway and grass now grew on once-busy thoroughfares. It would have amazed contemporary observers that the mighty railroads would be supplanted by road vehicles but, as the author reminds us, the Age of Motorcars may be just as doomed to end due to overcrowding, construction costs and environmental effects and what we see is irreplaceable may not be so. The first cyclists were wealthy, able to afford their expensive machines, and wealth means influence. 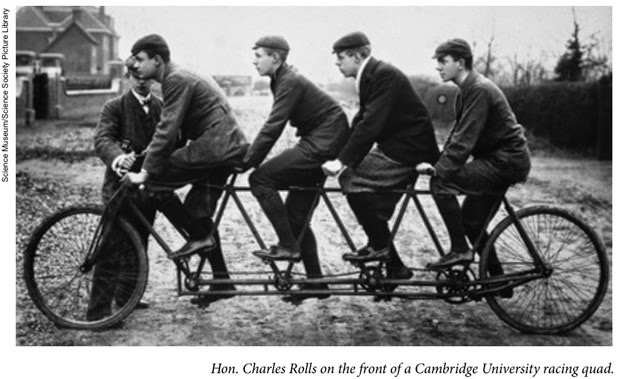 Many of the early cyclists were professionals and the ranks of Parliament including more than a few, both in the Commons and the House of Lords. They demanded smooth, dust-free roads and passed legislation that reorganized jurisidiction over roads, once seen as completely local, and mandated their maintenance. Serious lobbying occurred on both sides of the Atlantic and very considerable success was achieved. New technologies arrived to make the construction of these new roads possible and we are given an overview of them, from asphalt to macadam to, surprisingly, wood. One thinks of cities like London offering primarily cobbled streets (“setts” rather than “cobbles, technically) but in fact many of the city's thoroughfares were made up of hardwood blocks which may have been smooth to travel over but in the Age of Horses not very sanitary at all and probably not that durable under iron-shod wheels. In addition, the asphalted streets of Washington, DC, were seen as worthy of emulation elsewhere. 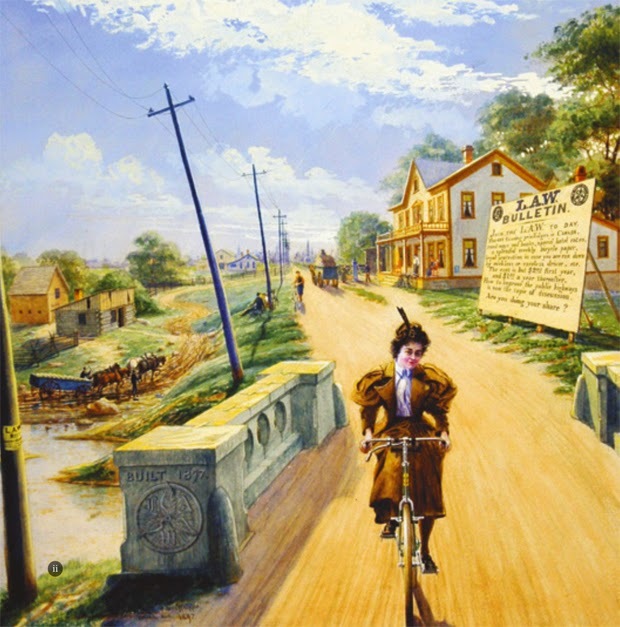 There were wonderful projects planned, including an elevated bicycle highway in California. But this remarkable state of affairs had a dark cloud on the horizon. The groundbreaking work (in every sense) of the road lobbyists of the LAW and CTC was soon to be overtaken by a new user of the road. The motorcar, which was not distinguished by sweet odours from nature's garden but was rather characterized as a murderous “stinkwagon” arrived noisily on the scene—driven for the most part by those same people who had been early adaptors of the bicycle! There was a great ruckus and attempts to ban cars. The author details how the lawful rights to road usage were once determined but arrogant motorists simply forced other users off of the roads as might became right. Where once pedestrians, cyclists, streetcars and other modes of transport flourished, all fell before the onslaught of the mighty car. And now we come to the interesting idea behind the book: all the efforts of cyclists, those two decades of raising money, printing pamphlets, lobbying legislators and even building demonstration road sections, to ensure the acceptance of good roads, roads that were invaluable to all settlements they passed through for the common good, have not only been forgotten but history has been rewritten. For example, the author cites the self-congratulation of the Ford Motor Company in 1927 when, marking the building of the 15 millionth Model T, it claimed that the Ford car “started the movement for good roads.” This claim was to be repeated across the country. It was ironic in that Henry Ford's first car, the Quadricycle, owed much more to the bicycle than the carriage, as was often the case with pioneer automobiles. Henry Ford had been a keen cyclist and as the author points out in a fascinating appendix to the book almost every major figure in the automotive business had some connection to bicycles. These included Henry Leland, who founded both Cadillac and Lincoln; Albert Champion of spark plug fame and winner of the 1899 Paris-Roubaix bike race; Louis Chevrolet; the Dodge brothers (who once had a bicycle business in Windsor, Ontario); the Opel brothers (whose father, Adam, refused to consider constructing “stinkwagons for the rich” and now has a car named in his honour); Peugeot; Pierce-Arrow; Rover; Rolls-Royce—the list is impressive. 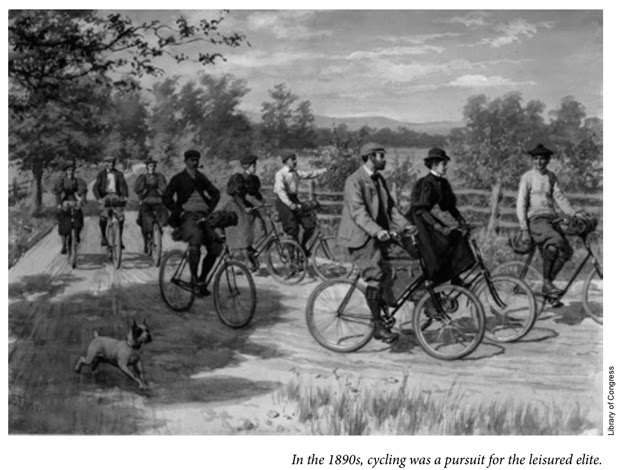 Not only did the automakers take advantage of the roads that were the work of the cycling lobby, but they also were able to use many technologies that were first developed for the two-wheeler, including spoked wheels, pneumatic tires, ball bearings, differential gearing and chain drives. With the advent of trams and buses, and eventually motorcars, the decline in cycling became precipitous. In 1898 there were 103,293 members of LAW; within seven years that number had fallen to 2,874 even though cars were not yet widespread. But as the car ascended, the bicycle, once seen as the very symbol of modernity and progress, became a second-class citizen on the very roads it had once made possible. It is only in recent years that bicycles have regained some of that lost status and may play a more important role in our transportation (and fitness) future than anyone would have thought. Of course, there are countries such as Denmark and the Netherlands where the use of bicycles is already widespread but these other examples are beyond this book. “Roads Were Not Built for Cars” is a fascinating book, describing the development of much of the world we see outside our doors if we live in an industrialized country. But it is also a warning about the dangers of twisting history, of forgetting why things are the way they are and in that respect provides much food for thought. Perhaps in a century people will be amazed at the idea that we once found 1.24 million annual deaths due to motorized traffic acceptable (war kills less than half a million), along with horrific air and noise pollution, the asphalting of our countryside, the need to support otherwise unpalatable dictatorships to ensure our fuel supply and the primary source of anthropogenic climate change in order to have two-and-a-half ton SUVs with one obese person in them sit in gridlocked traffic. As much amazed as they would be by the decline of passenger railroads or the disappearance of stagecoaches, perhaps. 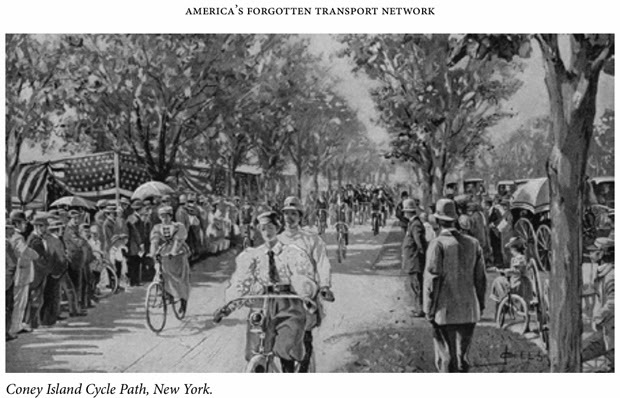 “Roads Were Not Built for Cars,” which surely can be said to break new ground in cycling history, shows us not only the highway from the past but also how we might want to consider how we view the future. So the next time you are out cycling that smooth asphalt, think of how it came to be and salute those brave wheelmen, now forgotten, who made it once possible. But watch out for those cars.